In search of the Killer Contact Center Script (UCCX or ECC)! After your first 100 or so Contact Center Scripts, you begin to wonder if it would be possible to generate a “killer script”! No matter how many hours you sit with clients and do your very best to extract their call handling requirements, it just never seems to be enough! Generally, you have some block of professional hours to complete the script, test, train and turn up before “go live”. You ask the client for their requirements and “wish list”, then prioritize the list toward the goal of getting as much done as possible within the budget allocated to the project. You no sooner get the script up and operational and the client is asking for six options that never came up during the time you were discussing requirements. They were never even on the “wish list”! Last time this happened to me, I determined to write a script which would have run time options for the various script extensions I have seen over the years. Starting with a basic Generic script which had modules you could switch in and out to achieve not only increase functionality, but efficiency in both cost and time. Route Type? Prompt and Collect! Most call flow scripts can be reduced to answering an incoming call, playing a menu of options, navigating to a Contact Service Queue, finding the most appropriate human resource or managing queue handling while the caller waits for service. Sometimes there is no menu after the call is answered, and the call is sent directly to the Queue. At other times, we need to provide some “prompt and collect” for database look up prior to call routing. We are always looking at operational alternatives for time of day, day of week and holiday or emergency closings. This sounds like something we could develop into a general purpose call flow script, complete with generic record prompts in the language of choice. So the Killer Script contains a library of professionally recorded prompts and prompt segments for enabling you to assemble your own prompt! Where are the IVR Prompts and professionally voice WAV files? CCAdmin to allow supervisors to Open and Close Queue with custom Closed prompt! So we now have a Generic Call Flow Script that has an option for a Contact Center Administration and prompt management! The Generic Call handler offers some run time options that can be set at run time. They include a ROUTE TYPE (i.e., Menu, Direct, IVR or Transfer) that dictate how to handle the incoming caller. In fact, we can change the route type based on the DNIS or ANI, so the script actually changes its call flow to play a Menu or send the caller direct to Queue with each new call. We then created a Contact Center Administration module that would allow an authorized user to open and close a queue on demand by dialing into an IVR script. If you closed the Queue, you were offered the option to record a new closed greeting. Optionally, you could record any existing prompt by entering the prompt number. All of this done by an authorized user with a PIN number and not requiring the System administrator. Queue management was another area in which a modular approach to scripting could enable a range of options. Do we play “your estimated wait time” or “your position in queue is” or just play music on hold? If they are in Queue awaiting an agent resource, do we offer them options like, “Press 1 to leave a message, 2 to schedule a call back, or continue to hold and your call will be answered…?” Not every client wants these options, but many want the choice. How do you make that option available without burdening the project with more develop hours? In fact you might want these options to change based on who called or what number the caller dialed. We determined to add a third module to our script library. We can now offer the call back option on module basis. Clearly every call center is different. You will always need to modify your scripts. It is possible however, to create a flexible, reusable script that has configuration options or modules. It is also possible to make these options available at run time based on DNIS or ANI. There is no need to launch a separate script when you can reconfigure the same script on the fly to address the various call handling options required to manage a caller through a successful contact center interaction. Ask us about our generic scripts and save yourself a ton of money while paving the way for self-managed call center flexibility as you move through your business process! 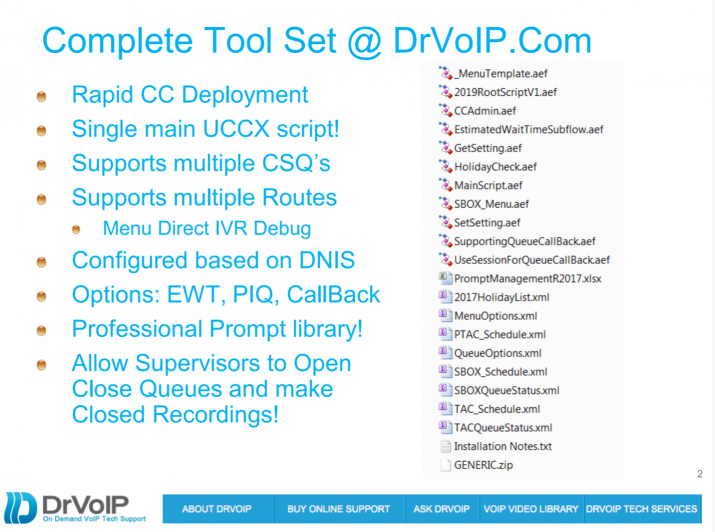 DrVoIPGeneric, DrVoIPCCAdmin and DrVoIPCallBack are all available for CISCO UCCX and come with professionally recorded generic voice prompts that can be easily branded. We also include supporting XML documents for Scheduling, Holidays and a Queue options template for changing call flow based on DNIS! Killer Script Overview – Updated for 2019 Version! 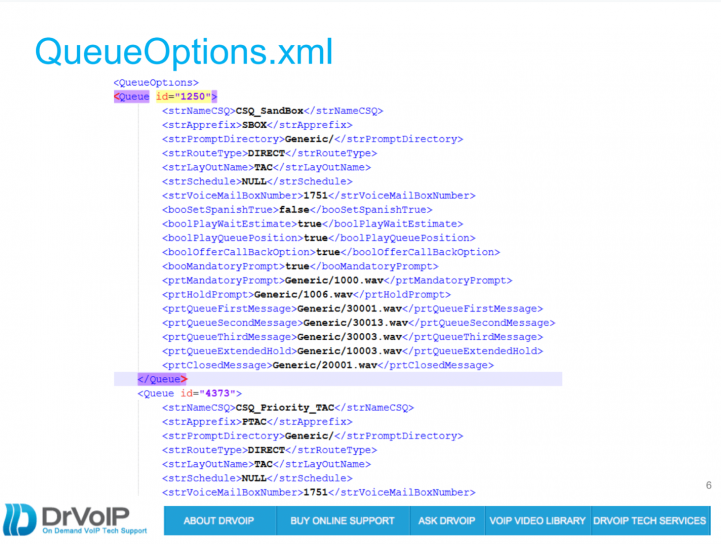 The Core Root script is a single thread that enables both application level run time variables as well as “variables on the fly” through the QueueOptions.XML file. Typically the script will be trigger by one of the DNIS numbers attached to the script. This DNIS become strDNIS in our application and it is used to index the XML file to pull back all the variables for that specific CSQ. One of the variables that is returned is the strApprefix value. For example we have “CSQ_SandBox” for testing and it has a strApprefix of “SBOX”. This variable is prepended to objects like Queue Message Wave Files. In this way SBOX_QueueMessage1.wav and PTAC_QueueMessage1.wav can both be represented by strApprefix+”_QueueMessage.wav” in the same script! This also makes it possible to create Layouts that are pushed out to the agents. The QueueOptions file contains all of the variables that you want configured for a specific CSQ. It sets options for offering Estimated Wait Time and Position In Queue. We offer the option of a call back without losing your place in queue. This has a variable that can be set to enable “record a short message to be played to the Agent before you call is returned” or to disable that option and move directly to collecting the target call back number. Some CSQ’s require that the caller be sent directly to the Call Center. Others require the caller to navigate an IVR or MENU and the option strRouteType defines these options. If the caller is to be offered a Menu of choices the script loads the correct menu, again using strApprefix to bring back SBOX_Menu.aef at the appropriate point in the call flow. Likewise the caller can be directed to an IVR platform before the call moves to the call center. The Killer Script is actually a series of scripts, documents, professionally recorded voice prompts and sample XML documents that you can copy, modify or edit to suit your call center CSQ configuration goals. All this for $295? What a deal, your average professional service company is billing scripting engineers out a $275-$350 and hour! If you have any scripting experience at all, you should be able to configure this script! Optionally, we can quote a fixed project fee to install and configure it for you! Text Us at 929-292-8100 for details!